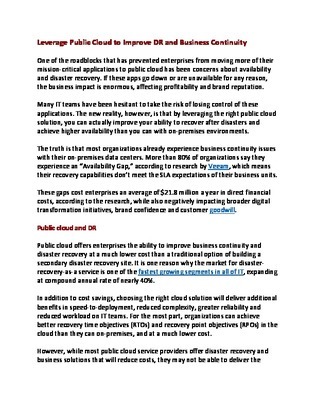 Concerns about disaster recovery and availability have held many organizations back from moving mission-critical applications to the cloud, and understandably so. After all, shifting apps from on-prem to the cloud ultimately results in some loss of control. But as it turns out, when harnessed correctly, public cloud can give enterprises more robust business continuity than existing on-prem environments ever could hope to provide. Click inside to learn how – and how this can even apply to mission-critical applications.